I noticed this ad on Flickr today. In one way it's a pretty clever ad. It takes a standard square and divides it into three separate click-able areas. Each area has its own Blue Lithium tracking link. That's a good use of space. I also think it integrates well into the Flickr search results. In another way; what the heck? 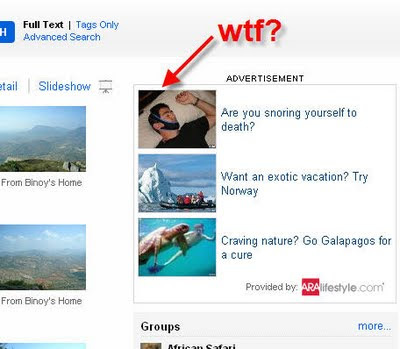 Are you snoring yourself to death? My snoring would have to be dangerous before I was willing to strap myself up like that at nights! If you fear your life is in danger unless you fasten your jaw shut then you can check out the product page here!